The Buffalo Public School District continues to strive for cultural diversity. 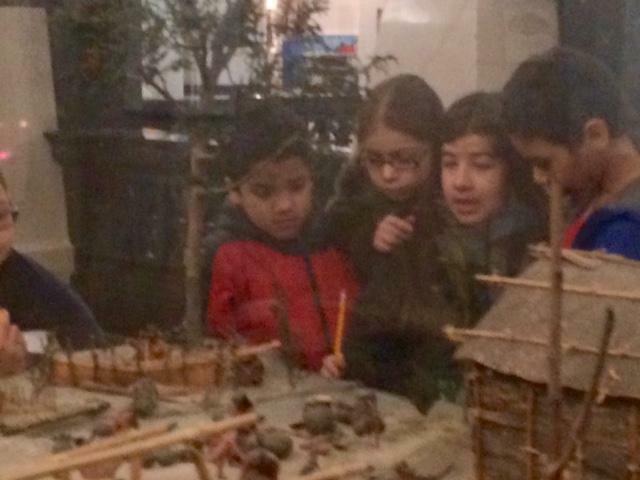 About 80 elementary students had a chance to explore Hispanic history during a trip to the Buffalo History Museum. WBFO's Focus on Education reporter Eileen Buckley says students viewed an exhibit that features Echando Raices: Hispanics Building a Life & Legacy in Western New York. Buffalo school children tour the Buffalo History Museum and review a Hispanic exhibit. Fourth and fifth grade students from the Herman Badillo Bilingual Academy and Frank Sedita Elementary had a chance to venture beyond their classroom walls explore Hispanic heritage. They listened to a docent from the Hispanic Heritage Council. Students listen during their tour. The Buffalo School district created this field trip to actually align with the State's Social Studies framework. It supplied a lesson from both the state and Buffalo. "They've learned about contributions of Americans, now they are seeing contributions of people that look like them, people that speak similar language," said Charles Brandy, Director of School Students for the Buffalo Public School District. Although the students are out of the classroom, they're still required to learn. This field visit provided important learning skills, cognitive strategies, content knowledge and self-management skills. Students look through glass case at Museum exhibits. "We try to make sure that we can extend the classroom experience to the actual site where students can understand and investigate text and learn from primary resources as opposed to just learning mainly from the text books," noted Brandy. For many Hispanic students had a chance to learn about past Hispanics who left contributions to the community dating back decades. "Being Puerto Rican and being in Buffalo means something," said Michele Agosto, Supervisor of Art Education for the city schools. She also serves as director of Hispanic heritage council "And then they see faces that are similar to theirs, history that they understand and know." Students tour the Buffalo History Museum and Hispanic exhibit. "We are always trying to find ways we can education all children. Once we stick to the core of what we have to do which is making sure students are literate, they can speak they can write, that those are important factors," said Brandy. Some of the students had never stepped inside the Buffalo History Museum. "We've never been. First time we came here," said the students. "When we were coming here, we were so excited because we didn't know what it was like." They were thrilled to step outside their classroom and step inside to explore history and Hispanic culture. "We are learning about the old days and stuff. We saw old books that was from 1892 to 1893," said the students. "Anything we can do to make them excited about learning and education, and just how we are all connected in the world, is really satisfying to me," stated Agosto. The amazement on the face of one young student discovering the size of the building and the exhibits was priceless. "Wow, my goodness," said one boy, looking at the large atrium with massive pillars inside the History Museum. When he got to the top of the staircase and saw some of the exhibits in glass cases, he responded again, "Oh my gosh." Echando Raices : Hispanics Building a Life & Legacy in Western New York.